A group of Georgian Court University students have made it their personal mission to help save a small, Italian village named Bedonia, in the Emilia Romagna region. With the economic crisis in Italy, businesses and citizens struggle to keep afloat, but these American students hope to change that. By building a website and social media platforms for the village, as well as contributing their efforts to promote a GoFundMe campaign to build an outdoor adventure park in the village to draw more visitors, these students are putting Bedonia back on the map. 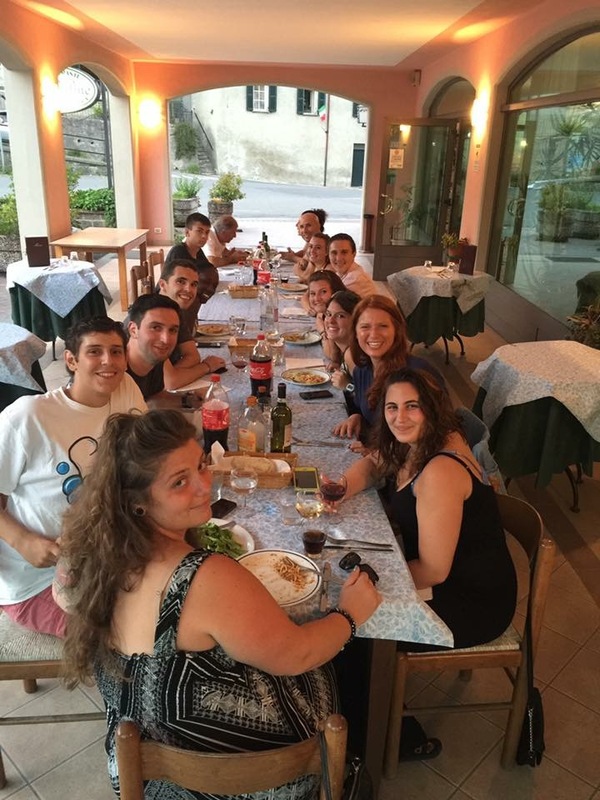 Below is the personal account of American student Kyle Homer’s time in Bedonia! Studying abroad is always promoted as a way to approach a culture that isn’t our own, and in our returning reflection against that culture we are supposed to learn more about ourselves. However, what some fail to realize is the immense feeling of sheer responsibility we have when we return back home. Seeing how thin our own culture has been pulled and manipulated by materialistic gains and monetary expectations leaves us feeling responsible for opening up the eyes of our fellow citizens to not only help keep these different cultures alive, but also a hope to bring our own back to its true roots. My experience followed this notion of conflicting cultures. I was part of a study abroad group, consisting of nine students, from Georgian Court University in Lakewood, N.J. 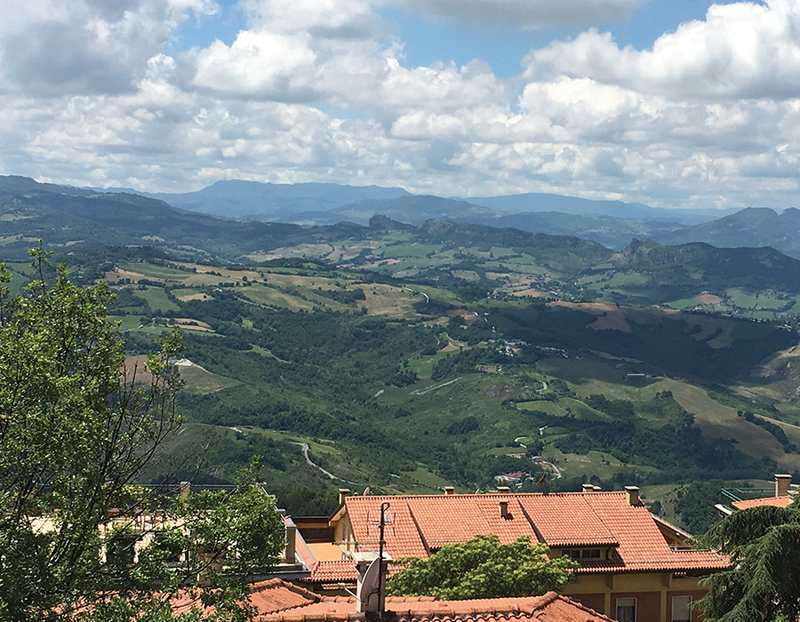 Focusing on a three-week social media project, we traveled to the beautiful town of Bedonia, Parma in Italy to live like locals and truly get assimilated within the culture. While we got the privilege to experience many different things during our stint across the world, our main objective was to help this small municipality build up its social media presence and allow it to have the voice it deserves within Italian tourism. 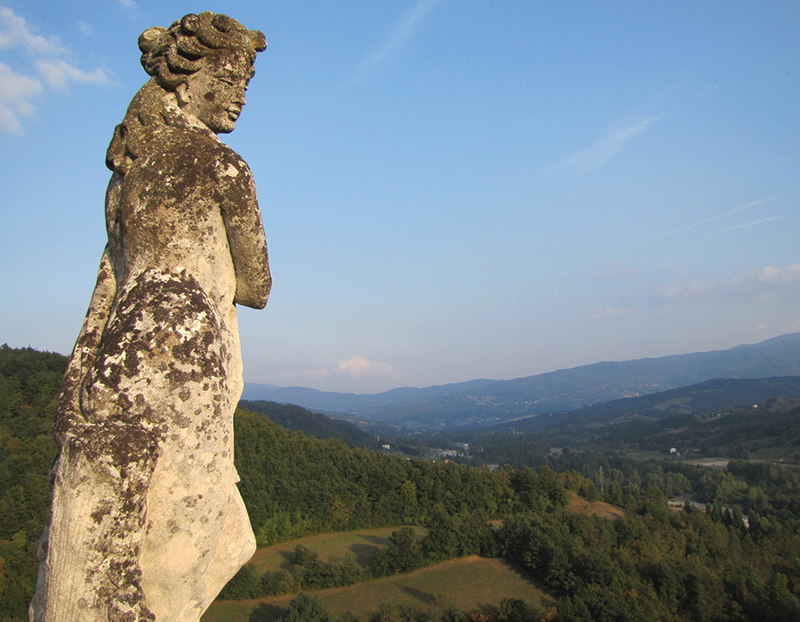 Bedonia is in the Emilia-Romagna region of Northern Italy. Graced with beautiful architecture and cobblestone streets, this quaint village is preserved within time and stays true to its historical origins. Outside of the town’s visual indulgences there are countless opportunities for locals and tourists alike to enjoy the simple pleasures of Italian countryside living. There are countless outdoor festivals and markets, outings for hiking and mountain biking, plus frequent live music just to name a few of its plethora of charms. Many Italian tourists frequent Bedonia each year to enjoy the fresh, clean mountain air and the beautiful rolling hills they overlook in their daily lives. With the economic crisis in the Parma region over the past few years, factories have closed and people have moved away in search of work. With the younger generations leaving for the surrounding larger cities, this gem of a town is struggling to survive and the splendor of an authentic Italian lifestyle is hanging by a thread. This is one of the last, genuine spots left in Italy that one can experience living like an Italian without being suffocated by the huge numbers of American tourists. There are no crowds, long lines, or gaudy souvenir shops to muscle the culture out of this amazing community. The surprising thing about Bedonia not being plagued with the negative influence of traditional American tourism is how centrally located it is around many other interesting spots. For example, after a tour of the Italian Riviera or the Prosciutto factory and Torrechiara Castle, returning to Bedonia for the local food, wine, and nightlife is always a major advantage due to visitors receiving the best of both worlds. To truly understand how much of a contrast Bedonia was in comparison to Rome, one of the more traditional tourist vacation spots, Villa Tre Angeli brought us to see many of the famous landmarks including the Vatican, the Coliseum, and the Pantheon. We were also treated to a trip to Verona, where we saw the opera “Aida” outdoors in an ancient Roman arena. Our time in Verona ended with a stop at the breathtaking, unfathomably beautiful Lake Garda. When we were finally in Bedonia itself, we saw how prosciutto and Parmigiano cheese were made. We visited castles, tasted some wine, went hiking and horseback riding, ventured to the local swimming hole, and still had time to gawk at the picturesque scenery. We were even welcomed by the Mayor and the Town Council who arranged countless things for us to do. While in Bedonia, we were graciously allowed to stay at Villa Tre Angeli B&B. 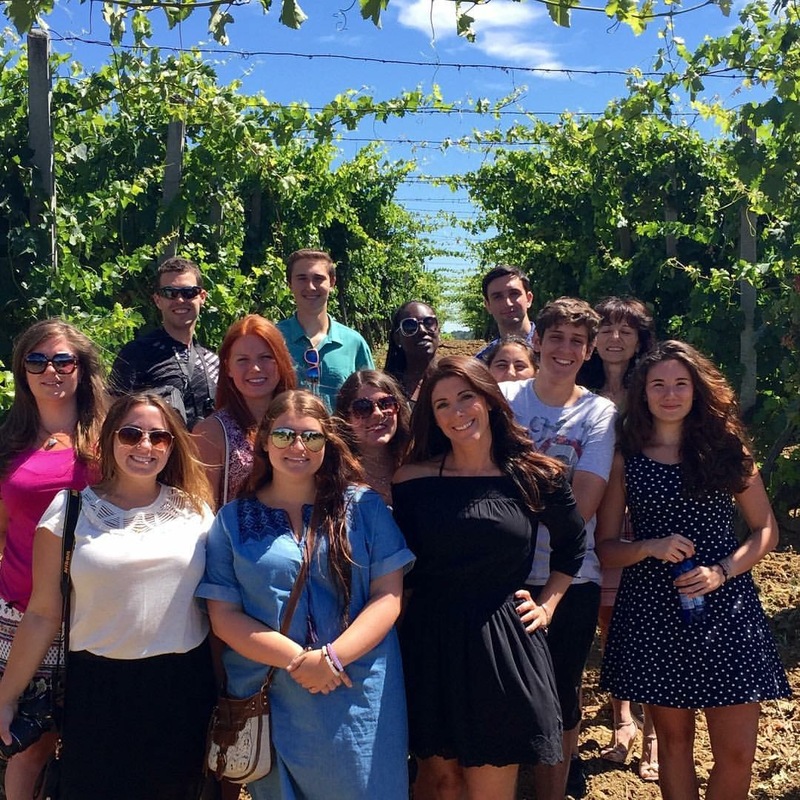 Georgian Court University has been working with Villa Tre Angeli to boost Bedonia’s involvement with social media so that in return more American tourists get the rare opportunity to visit an authentic Italian town. Under the supervision of Dr. Gina Marcello Ph.D., we have created a website where people can find information on the town and the surrounding area all in one easy-to-access location. The problem with most of the social media pertaining to Bedonia is not only is it in Italian, but it is not specific enough to come up on a search from an American Internet provider. 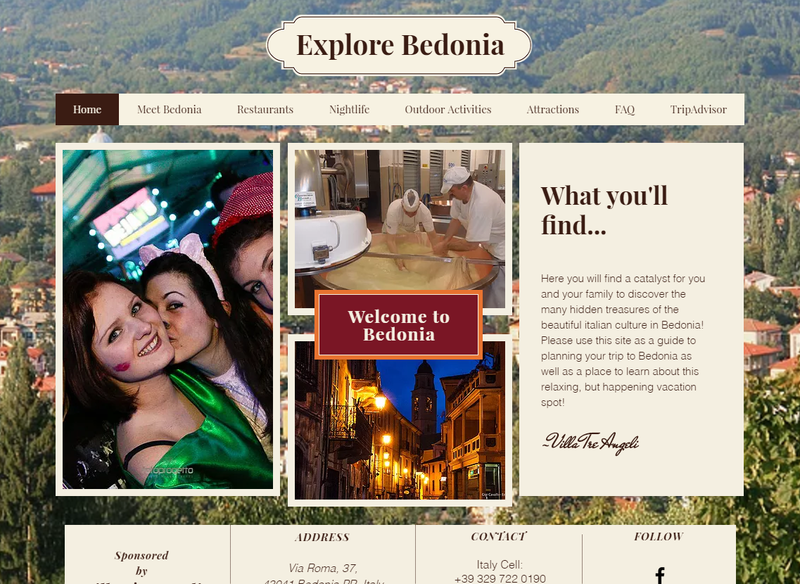 With the creation of our website, we’ve highlighted the best of Bedonia’s own resources while also adding our own experiences and opinions. Here, one can find pictures, endless lists of things to do, interviews, history, and links to frequently used modern day sites such as Facebook and TripAdvisor. While the website will give people a succulent morsel of what Bedonia has to offer, a true appreciation of this town cannot be captured by mere photos or words. Strolling into town and enjoying the culture first hand led us to return to the United States with the profound understanding that this tranquil way of life is crucial to salvage and must be experienced while preserving its authenticity. We became locals in a matter of days, and the town now has a bright future due to the unlikely meshing of traditional culture and modern technology. To see the progress that the students have made, visit www.explorebedonia.com. All photo credits attributed to Villa Tre Angeli. Image | This entry was posted in Culture, History, Italian, Italy, Travel, Uncategorized and tagged Italian, Italian American, Italian Ancestry, Italian culture, Italian Economy, Italian History, Italian town, Italian Tradition, Italian village. Bookmark the permalink. I’m not sure about an adventure park as a good draw. It will cheapen the town and detract from natural beauty. There should be consideration given to the arts, theater, pageants and seasonal celebrations that make use of the existing structures and attractions. A better way to upscale and draw in visitors is to get known for something like food, wine, or fashion. EmilyAnn Frances, i agree in part with what you are saying but i do feel that both sides can be catered to(plus what you mentioned above already exists)Nothing exists in the area for children,absolutely nothing,for miles and miles !!! My origins are from Bedonia and we still live there part of the year,it’s truly beautiful but seriously needs help if it’s not to become eventually a ghost town !! I take this opportunity to THANK EVERYONE involved in this very worthwhile project !! !